Looking for something different to eat after Thanksgiving – try this! Thankful for simplicity! Place your ground meat on medium heat to brown. You want this to brown slowly so the flavored can soak in. Take 2 pinches of sea salt and coarse black pepper and season the meat. Add 1/2 of the onions, jalapeños, 1/2 of the finally diced cilantro, 4 tablespoons of lime juice and garlic (see ingredients). Let simmer and brown. Now this is important: Taste your food. This is when you add seasoning. Salt should not over power your food. Make it flavorful with your natural ingredients. You may want a little more line juice for a kick- it’s up to you- if you want more spice, add another jalapeño or a hotter pepper or a pinch of cayenne. It’s up to you. If you add more flavor, let simmer in low for about 5 to 7 minutes more. Once you get it where you want it, remove from heat and remove any excess oil from the pan. Dice up you tomatoes and avocados and season them with a little salt and pepper. Set them to the side. Finally, warm another pan and place a little olive oil in the plan. Warm up the pan and then warm up your corn tortillas. (You can even warm them in the microwave.) 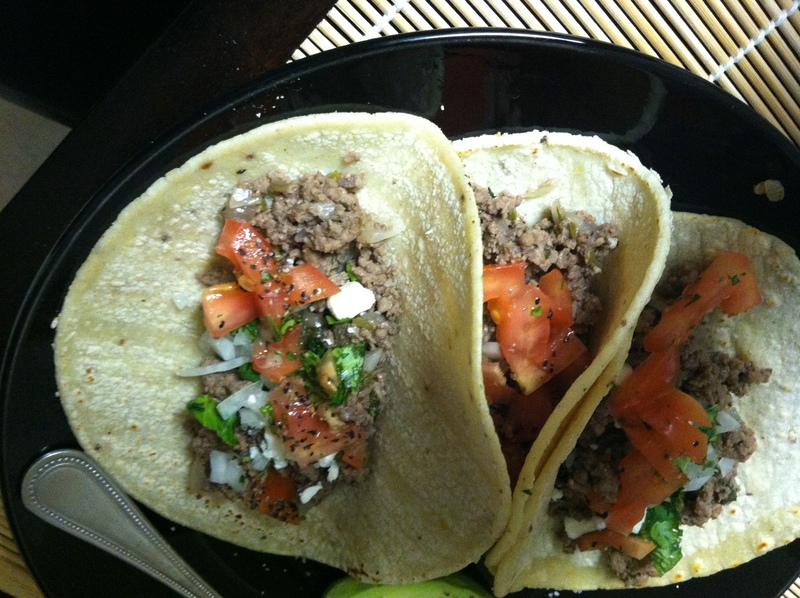 Place your tortillas on a plate and garnish with seasoned tomatoes, cilantro, onions, avocado and feta cheese.